There are more natural disasters, more conflicts, and more people displaced and in need of humanitarian assistance today than ever before. The first-ever World Humanitarian Summit in May 2016 aimed to focus attention on responding to people in need. What's at stake, what needs to happen, and what is CARE doing? By 2020 CARE will more effectively assist and protect affected populations in challenging and high risk environments. By 2020 CARE will empower women and girls as change agents and leaders. By 2020 CARE will secure more resources for first and frontline responders to spend on humanitarian action, disaster risk reduction and climate adaptation and loss and damage. 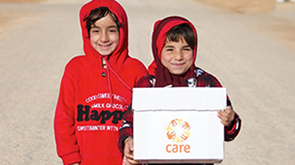 By 2018 CARE will develop concrete targets to increase direct and predictable financing for response, in particular national and local actors, and advocate for long-term support to ensure all humanitarians are able to maximise their impact. Read blogs by our expert humanitarian staff about what's at stake at the World Humanitarian Summit - and what we think of the outcomes.